What an awful lot of zombies there are on film lately. There’s a world of them in World War Z which I won’t be watching. It looks like every other American-saves-the-day blockbuster. I might read the book though. I’m much more tempted to watch Warm Bodies which came out recently. I loved Zombieland, enjoyed Shaun of the Dead, didn't hate I am Legend and thought 28 days later was inspired (28 weeks later, less so). My personal favorite however is Land of the Dead (2008) At this point I should confess that while I've seen other zombie flicks (Resident Evil, Undead and others) Land of the Dead is the only one of Romero’s works (original or remake) that I have ever seen. George A. Romero’s status as the greatest zombie film maker of all time means this might disqualify me in some peoples mind from writing on this topic. On the one hand I agree. On the other hand I remind people that this is the internet and I am undaunted by my ignorance. Perhaps my brother Tim, as the family’s horror champion, could add his own thoughts. 1. Mindless, rage-filled, diseased, unholy, not really alive, hungry! The first definition includes actual qualities of the zombie. That is the zombie is treated as an actual thing. I use the word actual quite deliberately. Of course zombies are not events in the real world but that doesn’t mean that they are not treated as real in the fictions that discuss them. They are genuinely distinct from non-zombies. That genuine distinction is of the realm of objective qualities rather than merely how they are perceived. I use the word “actual” to describe this. The second definition is different. It contains not the qualities of the zombie itself but the qualities of the gaze that produces the category of zombie. It is in fact more of a definition of the human ethics by which zombies, deserving or not, are recognized and treated as such. Land of the Dead is interesting for emphasizing the second definition because while actual zombies don’t exist outside of fiction (or do they? ), the category of zombie (the second definition) is very much a part of the real world. There are many people who are considered expendable, too populous and a threat. Tragically refugees in the Australian political context come to mind. What makes a zombie a good metaphor for how these people are being viewed is the idea of “depth of personhood”. Our minds can extend out of our bodies. Just imagine your own back yard. Upon imagining it you may well have projected yourself into that space. You are possibly there now (mentally) looking at the yard work that needs doing. In this way we can virtually “see” around corners. Zombies in movies do this too. They hear a noise (not just any noise but the noise of people) and go to investigate. Sometimes they smell living flesh many miles away and travel to it in order to feed. To do this they must be able to project themselves mentally to the source of the sound or smell, to anticipate what they will find when they get there. My mind and with it my sense of self also extends internally. In the form of my hopes and fears and pain sensations, identity conflicts and so on, I have depth. In fact I would say that most of the time this internal world is a trillion times larger than my external one. The yard work I need to do is dwarfed by the internal feelings of pride and shame that accompany completing it or not. My self-hood may be infinitely deep. I can, after all, reflect on my reflections. Whole worlds of thought can become enveloped in another world of greater scale by mere pondering. When my heart breaks it feels like the universe ruptures and then from a later vantage point that universe of heartbreak will seem like a single satellite. Over my life there are galaxies and galaxies of internal life created and explored inside of me. We can’t directly observe this internal world of others and unlike how our minds extend externally we don’t have any great evidence of its processes. It’s not easy to even infer the full depth of another person’s internal word from what we can casually observe of them. Art can be a way to communicate it, intimacy can reveal it, but mostly we have to hypothesize from our own experience of life and our external similarities that we are internally (roughly) the same as other people. This reasoning process is so ingrained that its conclusions feel intuitive. In fact this is probably the best example of intuition I can think of. We realize that other people go as deep as ourselves because they are otherwise like us. It’s very much the basis of empathy which I believe is in turn the soundest basis for morality. A zombie despite appearing superficially similar to humans is afforded none of this depth to their personhood. Their internal life is gone (or imagined gone). They don’t hope or fear or attach meaning to events. They certainly don’t reflect on their reflections as deeply as you or I. They are essentially going through the motions of being human. They are “soulless” (or are they?). Once people are put in this category of Zombie it’s easy to see how they can be indefinitely detained or killed. They are completely expendable because even when they experience pain it just isn’t as meaningful as the pain we experience. It’s a purely sensory thing not the deep universe-rupturing event of our own or another humans suffering. In a much more subtle way than what is happening politically in Australia with refugees I think we are always creating these sorts of zombies around us. That is we are always forgetting or dismissing other people’s equal internal depth. Perhaps it’s almost impossible to equally appreciate the depth of personhood that others possess as we do our own. We may achieve it occasionally with our family and close friends but it seems to me that we struggle to sustain it even there. Genuinely living with the knowledge of other people’s depth of personhood as infinitely large as my own seems similar to Buddhist concepts of enlightenment. In other words some distance away from my current state of wisdom. Powerful forces encourage us to perceive people as Zombies – not everyone, as that would make us a psychopath, but certainly neither is everyone supposed to be a human person to us. As I discussed in a post titled "A current cry for help", the perpetrators of violence and our own fear are not the only voices dissuading us from hearing cries of help. Every part of life that simply has another agenda for us – another way for us to spend our time and money – is also interested in us ignoring other people’s situations of need. To do this we must create our philosophical zombies. Philosophical zombie is an established term which means specifically “a hypothetical being that is indistinguishable from a normal human being except in that it lacks …sentience.” I’m using it only slightly differently. I don’t think we care that a zombie possesses the external mind I spoke about that enables it to hunt effectively. That’s sentience too and we anticipate such a mind in those we place in the zombie category. 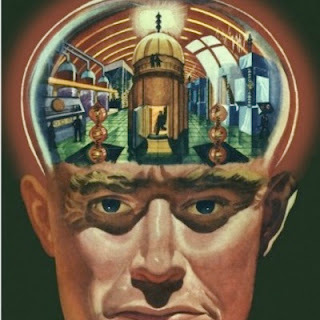 It’s the internal mind – the depth of feeling and meaning and significance – that we truncate in order to ignore our zombies potential suffering. We don’t even need to truncate it entirely. We only need to shorten it sufficiently to outweigh their needs with our own. Given the infinite size of our own internal life, any finite space for others may even be enough. While we contain galaxies, our zombies can still hold something like oceans of thought without it perturbing us too much if we step on their heads to get past. 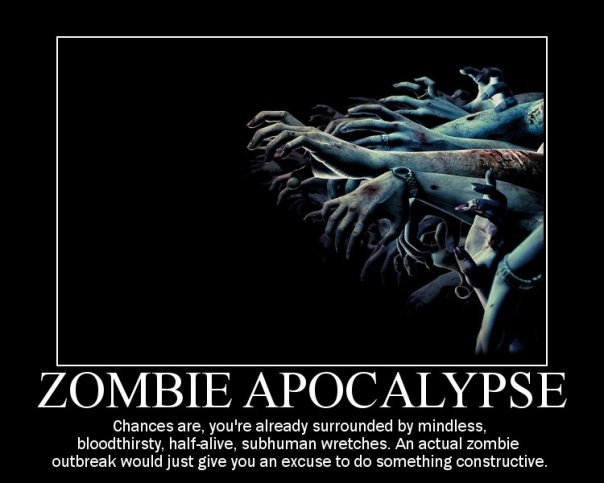 Everyday if we live in a major city a million such zombies may get in our way. They clearly have no idea of the magnitude of our internal world when they stagger in front of us, congest our car’s path or buy the last white choc muffin. Certainly they are not actually zombies we might tell ourselves in a quiet voice but louder voices will insist that they must be. Our tribal leaders, be they radio-shock jocks, pop-stars, preachers, advertisers and even academics thrive on declaring other people outside their fold as un-thinking and/or heartless. In other words, a zombie. And we are constantly stretching our mercy to forgive them. Haters of the graphic novel, watchers of Big Brother, executive and corporate types, Liberal voters, regurgitators of The Secret, are some of my own different tribe’s zombies. Your tribe’s zombies might include atheists or it might include Christians or it might include people who vaccinate or people who refuse to, or fans of Justin Beiber or people who don’t understand how amazing he is. How indulgent we all are to put up with them….just. In most zombie movies becoming a zombie oneself is the critical fear for the hold-out humans. Unlike picky Vampires or Werewolves who pass on vampirism or lycanthropy selectively, zombies tend to come in an overwhelming plague. This threat level of contagion justifies extreme measures in the containment and elimination of zombies. All the civil restrictions and military authority required are justified. The future of the human race is at stake. Even some humans may have to be cut loose if they drop behind. That’s the thinking of the member of the human party in zombie movies who ends up betraying the others. This person looks at people well before they get bitten as “likely” zombies anyway. They may even have had that attitude before any “actual” zombies showed up. They were always alone in how they understood the unique depth of their own person hood. Because movies are wonderful the sneaky backstabber who looks out for themselves or who exploits the zombie plague for personal gain will inevitably get bitten. When they do they are seldom that different as a zombie from how they were before. This is because the truncation of their internal life – the zombification of themselves – has already occurred for the audience. They are and were a villain. While human the villains mind extended externally as far as anyone else’s if not further. They never had a problem tactically projecting themselves where they needed to be to look after their own interests. But then a zombie can do that too. 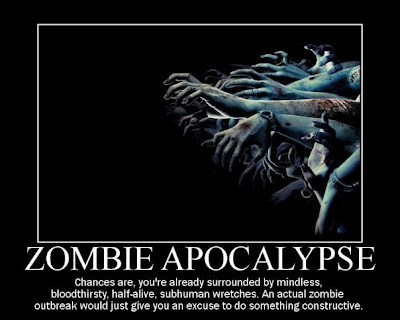 A zombie’s problem is their singlemindedness, the lack of greater significance to their actions and ultimately their reduction of even their loved ones to food. This is exactly (substitute food for target practice) the mindset of the zombie persecutor. It’s a paradox. The very gaze that determines others as zombies turns us into actual zombies. Great films of this genre explore this concept. In the real world we all have to grapple with it too. Whenever we cultivate empathy we deepen our internal life. 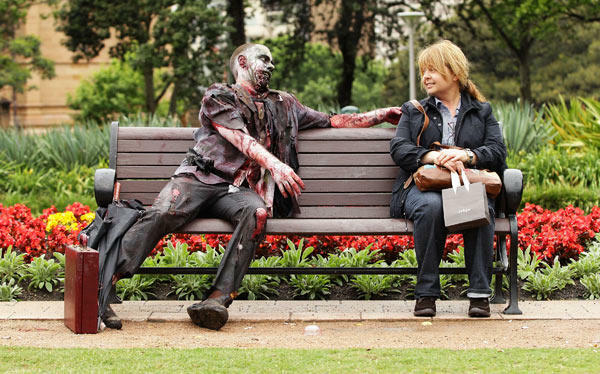 Whenever we give up on or dismiss the depth of reality for others we shrink who we are; As we see zombies around us we become more and more zombie-like ourselves. Firstly a warning; there are some slight spoilers for the latest Superman Man of Steel movie in this piece. There’s very little beyond what the trailers will tell you but if you’re careful about those things (like I am) then read no more till you've seen the film (or read the comic adaptation). I also won’t be censoring any comments that divulge plot points so they might give away more. Secondly another disclaimer; for this piece I watched a movie, flicked through the Bible, read some old comics, and surfed the net. That’s all. I haven’t conducted any research into relevant ancient Greek myths for example. I am not a Superman expert and there are many versions of his tale out there. I've seen most of them but I bow (respectfully) before greater geeks than me on the topic. I say this, not to deflect criticism, but to invite your own playful thoughts on the Superman legend. Zack Snyder's Superman movie, Superman: Man of Steel has generated some fun discussion. I have enjoyed disagreeing with the common description of Superman as an analogy to Jesus. It’s a point made on The Movie Show by David Stratton and a common parallel to be drawn. To be fair, this latest film strengthens - maybe even labors - this association. 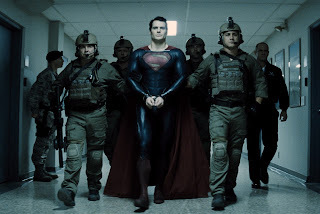 The scene in which the Man of Steel visits a chapel is reminiscent of the Garden of Gethsemane. Superman then allows himself to be bound and delivered as a sacrifice. Although he could free himself at any time he goes meekly into his captors’ hands. It’s very Jesus-like. In fact, rather than saying that audiences of Zack Snyder’s film who relate Superman to Jesus got the film’s metaphor wrong, I’d say the film got Superman wrong by making him so Jesus-like. It’s inevitable given the vast cultural space that Jesus occupies that any modern Messiah is presumed to be, even compelled to become, Jesus in another form. Whether the character is Neo in the Matrix, or Batman, or Superman, they are going to be seen as a variant Jesus. This is partly because we have forgotten that the Jesus story is itself informed by an older messianic myth, one which continues to inspire storytelling in its own right. That myth is Moses. This is the archetypal liberator of the Judaic tradition. This is, in my opinion, the better fit for who Superman is supposed to represent. Like Superman, Moses’ parents place him in a reed basket and send him down river. It’s an ancient version of a single child sized spaceship sent into space. When found, Moses is raised in an Egyptian household as an adopted son. Superman’s biological mother, just like Moses’, sends him off to relative safety. On the other hand Jesus - unlike Superman - is never separated from his biological mother. It’s not accidental that this key difference in the mothering of Jesus and Superman is overlooked. The position of the mothers in both Jesus’ and Superman’s story suffers from patriarchal diminishment. The way we emphasis Jesus’ divinity, it is as if Jesus is Mary’s adopted child as well as Joseph’s. Despite her constant involvement in his life Jesus is often only seen as passively parented by her – all his insight come from his divine lineage, not from his mum. Meanwhile Superman on screen struggles to reunite with his absent father rather than his absent mother. In Zack Snyder’s film this goes so far as to give his dead Kryptonian father a reasonable role in the film. Even his dead human dad has more screen time through flashbacks than Martha Kent. Commander Zod, the enemy of the piece comes across as another father figure to me, just an abusive one. Perhaps in this Jesusian version of Superman, Zod is supposed to be the Devil tempting Superman with the whole world. Fortunately the holy ghost of Kryptonian Dad protects our messiah. 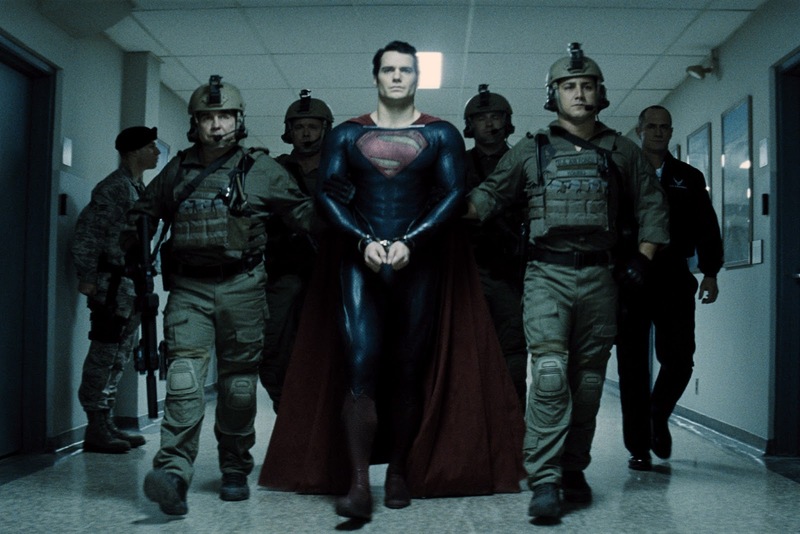 This really is a film about whose male vision for Superman, including his own and the U.S. military's will triumph. Zack Snyder's Lois Lane and Martha Kent are excellently cast and acted but they play support roles only. 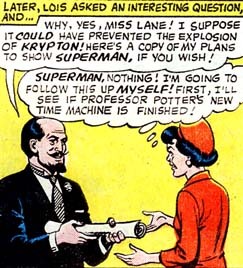 Lois Lane even abandons the biggest story of the world for Supermans’ privacies sake. The hard-boiled crack reporter and daredevil of the comics would never have made that choice. 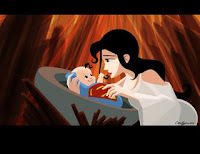 The riskier, driven Lois is not the only feminist difference between the Superman comics and the films.They don’t go as far as the Moses story where there aren’t any men involved at all in the send off, rescue and raising of Moses. 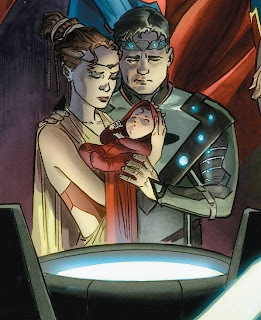 However the comics also don’t have any of the oppressively heavy daddy issues of the films either. While Martha Kent in the comics isn’t quite as strong a maternal figure as Aunt May (Spiderman’s adopted mum) she isn’t overshadowed by ghosts either. The film’s focus on patriarchal conflicts is a choice to take the Superman myth in a different direction – probably a misread Christian one. Supporting the claim of a connection between the original Superman and Moses isn’t hard. 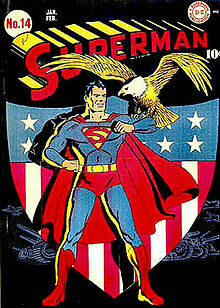 The character was created by two Jewish authors Jerry Siegel and Joe Shuster. Kal-El, Superman’s Kryptonian name is Hebrew for the vessel of God. The fact that Superman’s creators play down this connection and cite inspiration from a range of science fiction sources as being far more relevant is best ignored for the sake of a good story. Let us say no more about it. Then there are differences of course between Moses and Superman. Moses’ biological mother actually raises him as a wet-nurse in secret, at least to a certain age. Superman’s biological mother and her people are destroyed on Krypton. Moses’ people are very much alive. He grows up to lead them. Oh and Moses can’t fly. In some particular differences between Moses and Superman we have a fascinating development of the myth of liberator. By looking directly at these differences we can see a picture of immigrant Jewish identity in the context of 1970’s North America. Moses leads his people to freedom from servitude, drowning his adopted people’s army. Superman instead embraces a dual identity – both as Kansas Farm boy and the last Kryptonian. There’s something counter–Zionist in this both all-American and diaspora identity reconciled. Superman is at home in America as his creators. In fact they flourish there. Whether as character or character creators they are their new home’s greatest champions - yet still aliens. Superman’s adopted family, the Kents,are idyllic. They represent a small town ethical purity that grounds (no pun intended) Superman in his future use of power. European Jews like Jerry Siegal, the youngest of six children in a family that emigrated from Lithuania, would have appreciated that. In 1941 Nazi Germany conquered Lithuania which had previously been under the repressive Stalinist regime anyway. The idea of an American Way, embodied by “ordinary Americans” more than their government, has older roots than Superman but it’s definitely appealed to here. It is what the migrant hero must defend. Superman’s power to fly on earth originally came from the fact that his home planet of Krypton had a much heavier gravity than earth’s. This speaks to the ease with which migrants like Siegal and Shuster (the son of a migrant) can view their new countries relative to the tyrannies they flee. The comics also associated Superman’s powers with Earth’s young yellow sun instead of Krypton’s dying one. Superman’s power is a way of expressing the writers’ own flourishing in the young and vital ex-colony of the United States of America. 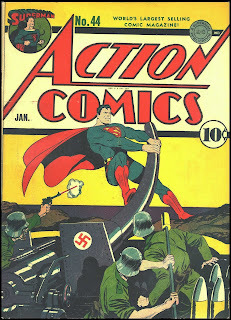 With that flourishing comes responsibility: Siegal and Shuster had Superman fighting Nazis across Europe well before the U.S. entered the war. A lot of these migrant themes of Superman are sadly confused or lost when Zack Snyder lays Christian weights onto the Superman myth. They can also be missed if we make too much of Superman as Moses for that matter. Ultimately Superman makes the most sense of all as Superman – a local homespun hero and the refugee of a dying world. It’s questionable whether this exact liberator fantasy continues to hold relevance for how migrants can understand themselves today. The United States of America on the eve of World War Two was an empire in ascendancy. It was a land of a youthful sun for many of its European migrants who flourished following its American Way. 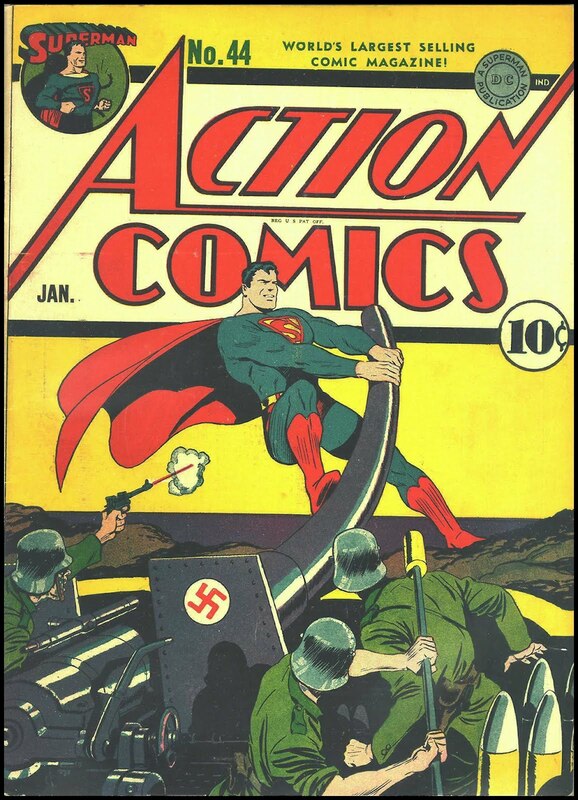 As the U.S. economy contracts or as other threats like ecological collapses (which featured in Snyder’s film) loom larger than European Fascism and Communism, Superman, at least as an American Superhero, will have to change to make sense. And then there's the question of what a U.S. hero with super-hearing and super-sight means in an era post Edward Snowden's revelations. The differences between the practices of government in Stalinist Lithuania and the Prism project may seem small to modern audiences. 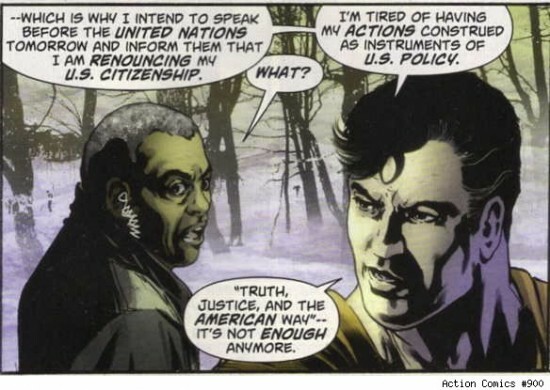 The comics have recently had Superman renounce his American citizenship. Zack Snyder made a nod to this concern when Superman destroys a U.S. drone that is following him. If that is what this latest film tried to do; make such changes as to bring Superman up to date I think it didn't really get there. I particularly hope Lois Lane's character is strengthened in the inevitable sequels and the story never revisits the emphasis on fathers in this film. Worst of all it just felt like a failure of imagination to create yet another cultural analogy for Jesus out of this character. Superman has their own complicated legendary story.